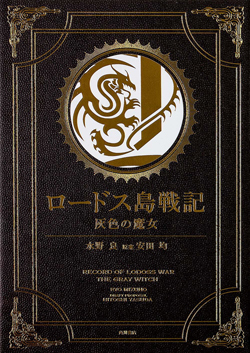 Seven Seas has announced a license for the novel Record of Lodoss War: The Grey Witch. This fancy-looking hardcover is planned to release on October 31, 2017 for 25 dollars. The book will include illustrations by Yutaka Izubuchi. Record of Lodoss War was a series of fantasy novels released in Japan from 1988 to 1993, written by Ryo Mizuno and published by Kadokawa Shoten. The series first started in the form of “replays,” or transcripts of tabletop role-playing games that worked with a high fantasy setting. There would be eight books released for the novelizations that followed, The Grey Witch being the first volume. An anime adaptation in the form of a 13-episode OVA would release in 1990 and 1991, and has long been considered a classic of the fantasy genre. There were also a number of manga adaptations, most of which appear to have gotten English translations. Some video game tie-ins were also developed, though only the Dreamcast title had an English release. I think it’s pretty neat to see an older title getting picked up here! Along with fans of the Record of Lodoss War anime, fans of all the latest fantasy light novels might want to keep an eye on this book, as it might have been an influence for some of their favorite authors. ← Review: Shuumatsu Nani Shitemasu ka? Isogashii Desu ka? Sukutte Moratte ii Desu ka? Yes!!!! Older Light Novels coming out makes me very happy!